After 5pm, please leave a message and we will get back to you on the next business day. 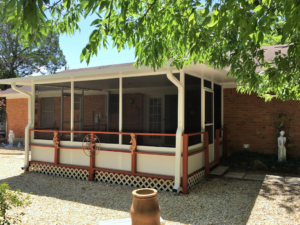 A new insulated Sunroom allows you to stay cool in the summer and warm in the winter at a fraction of the cost of conventional construction without sacrificing durability, strength or beauty. Keep the summer heat and the winter’s cold weather outside where it belongs. Our panels are put through extensive rigid testing to insure that your new room can with-stand the toughest elements nature can muster, including winds in excess of 120 m.p.h. There is no long term inconvenience. With the unique, patented construction system, you can literally enjoy the comfort and beauty of your new room in a matter of days. Our custom screen rooms are built with all aluminum materials for unsurpassed strength, durability and low maintenance. 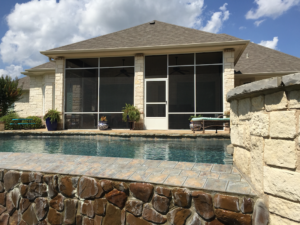 Aluminum extrusion will not rust, allowing you years of hassle-free relaxation in your new screen room. 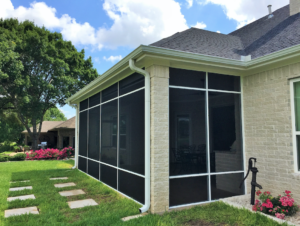 Fiberglass screens in a variety of colors and mesh sizes control both the heat and air flow letting you enjoy the best of the outdoors with the comfort of being indoors. You can enjoy the peace and comfort of your own backyard with out having to put up with the mosquitoes, gnats, flies and other pests.